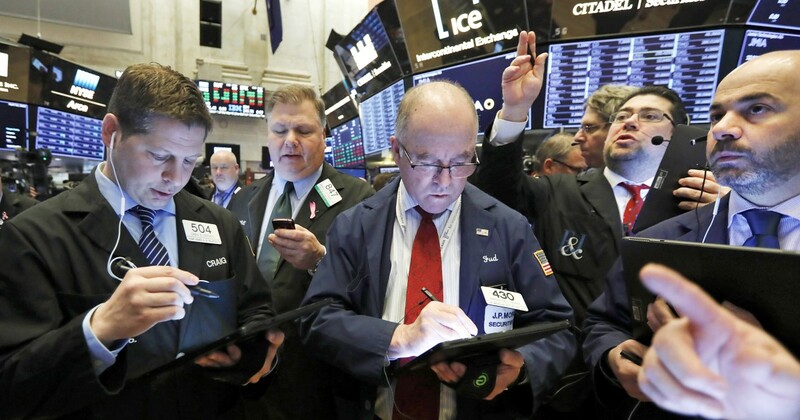 Wall Street has been watching closely as the biggest U.S. banks have reported first-quarter earnings over the last several days, trying to interpret what the results mean not just for the present, but for the future. “The issue, I believe, isn’t where we are today, but what does the near term hold?” said banking analyst Bert Ely. Most of the banking sector’s results have been a mixed bag: Bank of America and JPMorgan Chase each hit profit records, with Chase beating analysts’ expectations on revenue, as well. Wells Fargo beat analysts’ expectations for per-share earnings, but the company warned that net interest income — a key profit metric — is likely to drop by up to 5 percent this year. Citigroup, Goldman Sachs, and M&T Bank also all beat profit expectations while missing on revenue. “The guidance you’re seeing from a lot of banks just isn’t all that positive,” said Sameer Samana, senior global market strategist at the Wells Fargo Investment Institute. Some of that is due to the different types of financial activities and services in which specific banks specialize. “It’s the haves and have-nots. For banks that are more focused on capital markets activity such as Goldman, it was a pretty weak quarter… despite what was clearly a very robust quarter for equities,” said Stephen Biggar, director of financial services research at Argus Research. While ordinary Americans were happy to see their 401(k) balances recovering in the first quarter of 2019 after the market’s wild ride in the final weeks of 2018, a more placid environment isn’t necessarily good for bank bottom lines. “Banks make money, generally, on volatility,” Biggar said. Since spending and borrowing by both consumer and businesses remains robust, banks with a bigger retail or “Main Street” footprint fared better on the strength of commercial lending, consumer spending, and credit cards. However, analysts question how long this momentum can be sustained, especially as the stimulative effect of tax cuts fades, and whether banks will sacrifice quality for quantity. Interest rates present another challenge. Since higher rates contribute to higher net interest income, a more passive Federal Reserve could leave banks with fewer ways to generate growth. With revenue growth falling short, this suggests a worrisome trend: That banks are propping up profits with aggressive cost-cutting to please investors in the short term. And all of this is unfolding during the longest-running bull market, in a climate of near-full employment and low inflation — in other words, about as good an overall economic picture as banks could hope to see.